Turn R out of CP and down to main road. Turn L and take first L off main road. SO for 2km and turn R onto path between hedges. Follow path then SO over bridge and up to road junction. Turn L then R up steep hill. SO at X roads for 1.5km. At Gellyrhydd turn L down track SP Penybont. After 1km track comes onto road and zig zags to T junction. Turn R. Pass Croes Fach and turn sharp L up into woods on stoney track. SO for 2 km and cross straight oveer road. Follow track and to Llanbedr. SO at X roads and L at top of climb. 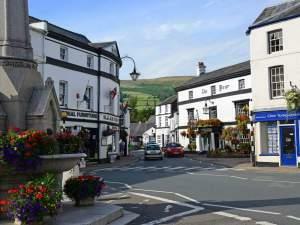 SO all the way back to Crickhowell. A465 or A40 from Abergavenny.